The top of the Asha line, the Nokia Asha 303, walked into our office to tell us about its 1GHz processor. We asked it about multitasking, but it quickly changed the subject by yelling “I have Angry Birds!”. The 303 has several things that elevate it above the majority of other feature phones – from the fast processor, through a capacitive touchscreen and QWERTY to Wi-Fi connectivity and 3G with HSDPA. We ruffled through the box quickly but found nothing unusual – a charger, a short microUSB cable (sigh) and a headset. The included 2GB microSD card was appreciated though. The phone itself is much more interesting. It’s not as thin and compact as, say, the X3-02 but it packs a hardware keyboard that’s very comfortable for its size. 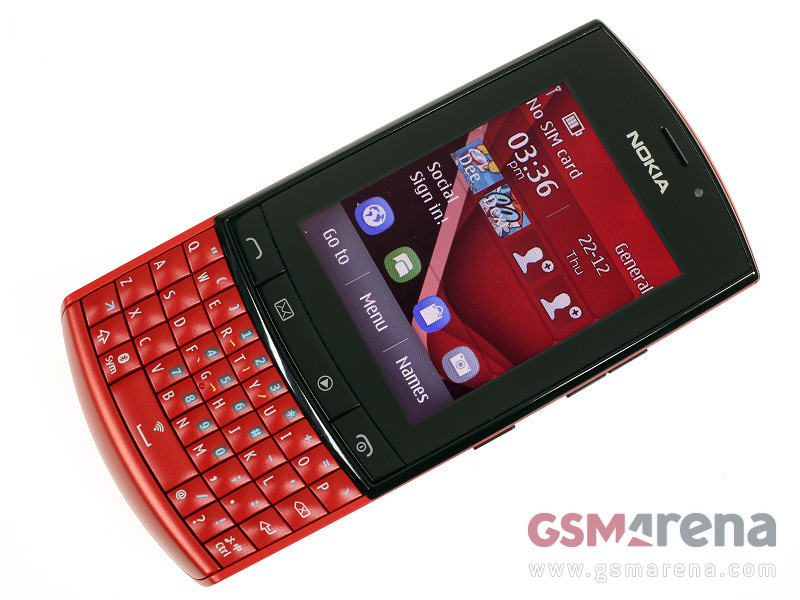 The Asha 303 has a curved back (complete with a brushed metal back cover) to fit better in the hand. The bezel around the 2.6″ screen seems rather large and it is. The screen remains at QVGA resolution where S40 phones have been stuck since forever. It’s tuned to ignore very light presses, which is often preferable to having it detect your finger midair. On the software side, the Nokia Asha 303 comes with more stuff preloaded than S40s of the past. We already mentioned Angry Birds, but there’s also Asphalt 4 and other games. Then there’s Nokia Chat, the Nokia Browser (which works similarly to Opera Mobile), Nokia Social and, of course, Nokia Store to get even more apps. Multitasking is not part of the latest feature phone software from Nokia. We hoped the 1GHz processor will finally unlock that door, but we were disappointed. You can control the music player and read/compose messages from the dedicated keys while in an app as you’ll see in the following video, but that’s it. This isn’t new either, the X3-02 could do the same.